Gold bounces off 1 month lows but lacks strong follow through. The commodity stalled its recent bearish trajectory and showed some resilience below the key $1200 psychological mark amid a modest recovery in the Dollar index. However, a bullish recovery seen in the equity market which tends to undermine demand for traditional safe-haven assets, kept the recovery for the yellow metal very limited. On top of that, market sentiment got a strong boost on Tuesday following reports that China’s Vice Premier Liu He and the US Treasury Secretary Steven Mnuchin have resumed discussions on trade in an attempt to ease trade tensions. Gold prices fell to reach $1196.20 support level during yesterday's session but quickly managed to recover and settle above the $1200 level. 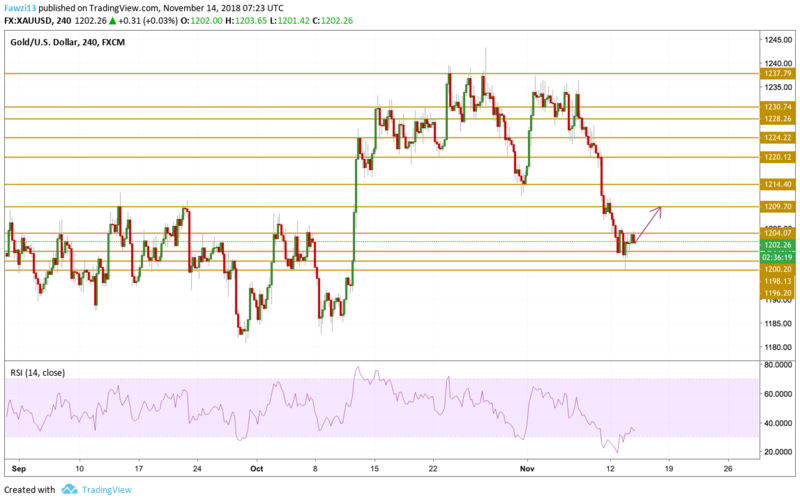 Despite the extreme oversold conditions, the yellow metal could not find the right traction to extend its recovery but instead, it formed a consolidation around the $1202 level. If it manages to pick up some momentum, then we will be watching the $1209.70 level.